Francis Bourke, who played for Richmond AFL Club between 1967 and 1981, relives a legendary moment for Toyota’s AFL Legendary Moments series. 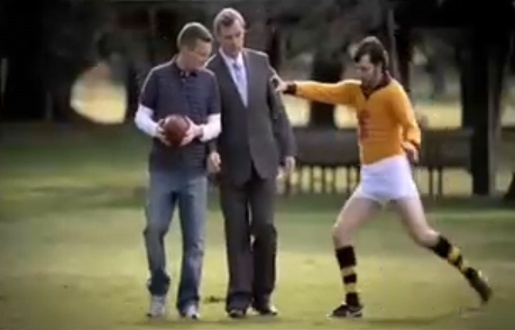 Stephen Curry and Dave Lawson help Bourke (known to many as St Francis) reenact a historic game played in 1980 between the Richmond Tigers and North Melbourne. Bourke received an accidental finger in the eye, which quickly filled with blood that poured down his face and on to his guernsey. At the time there was no blood rule (requiring bleeding players to leave the field until the bleeding is stopped) and Bourke shifted to the forward line. Although he could barely see through the mass of blood, he dived full-length to take a chest mark, then kicked an important goal to ensure Richmond had a narrow win. The Toyota AFL Legendary Moments campaign is being rolled out by Publicis Mojo, Melbourne, Australia, by creative director Darren Spiller, art director David Klein and copywriter Michelle Withers. Filming was directed by Dogboy via The Pound, Melbourne.